Dame Edna’s latest show, Dame Edna’s Glorious Goodbye, will make you laugh till you cry. It does so for two reason. First, Barry Humphries’ housewife/superstar is one of the greatest satirical creations for the stage. Second, this is the last time we will ever see her in Toronto. Humphries, who first debuted the character as Mrs. Norm Everage back in 1955, is now 81 and finds a life of endless touring too exhausting. Dame Edna has been delighting audiences for 60 years and has every right to retire. Toronto is Dame Edna’s second last stop in North America (the last is in Washington, DC), so if you want to experience the uproarious humour this unique character provokes for the first time, or the last, you have only until April 19. 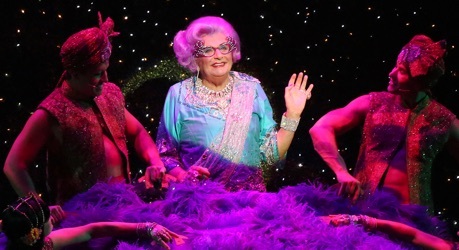 A valedictory note is struck at the very start of the show when footage of an alleged television exposé of the gigastar is projected on the gigantic right lens of Dame Edna’s signature ornamented glasses that make up Brian Thomson’s set. The documentary shows how the Svengali-like Barry Humphries manipulated an ordinary housewife from Melbourne, Australia, to superstardom for his own nefarious purposes. That may be the set-up but the effect is to show us how the concept of Edna Everage evolved from simply a satire of the narrow-mindedness and dowdiness of the Australian housewife. The black-and-white footage from the 1960s before Edna left Australia show a cheery raincoated frump with long dark hair – a far cry from the lavender-haired wearer of outrageous sequined gowns we now know. The transition of Edna from a satire of the blinkered Australian worldview to a satire on the cult of celebrity did not occur until Humphries’ 1976 London show Housewife, Superstar! Only four years earlier Edna had been made a “Dame” during the course of an Australian movie written by Humphries. When the introductory film starts to dwell on unsavoury subjects such as Britney Spears-like up-skirt photos of her that appeared in the press, Dame Edna finally makes her entrance. Anyone who has seen Dame Edna’s previous shows in Toronto – Dame Edna: The Royal Tour in 1999 or Dame Edna: Back with a Vengeance in 2005 – will realize that there is very little new material in the present show. In fact, especially in Act 1, the show is more like a compendium of Dame Edna’s greatest routines and is entirely appropriate for a farewell tour. As usual, Dame Edna mocks the audience for their slovenly appearance and the “paupers” in the balconies for their poverty, assuring them that she will look up at them in direct proportion to how much money they paid for their seats. As usual, she singles out select audience members in the first two rows for public criticism meant, of course, only in “the kindest possible way”. As usual, the main subjects of her criticism are their “affordable” clothing, their descriptions of their houses, their general appearance and their age. According to Dame Edna, she is not “picking” on these people but “empowering” them. She describes this interaction with audience members that makes up the majority of the show with her famous line that it’s “an intimate conversation between two friends, one of whom is a lot more interesting than the other”. The reason why Dame Edna’s criticism of the audience is so side-splittingly funny is that Edna is such an ideal embodiment of the egocentric celebrity who is famous for no other reason than being famous and whose pretence of loving her fans is constantly undermined by her disgust at their inferiority. Dame Edna merely says what we are sure other celebrities or one-percenters only think. While Dame Edna’s topics remain the same, there is a subtle shift in emphasis between Back With a Vengeance and this show. In the earlier show Edna made fun of the paupers perhaps twice and left it at that. This time she returned to the subject of their poverty again and again. Subversive as her character is, one can only assume that Humphries is responding to the awareness in the past few years of the increasing gap between rich and poor in the world and is using Edna’s gleeful insensitivity to satirize those on top. Edna’s main monologue in Act 1 concerns family and how it is best for parents and children to be rid of each other as soon as possible. We hear about her gay son Kenny, who supposedly designs all her frocks, and whose “friends” make up a sizeable amount of the audience. We also hear more about her lesbian daughter Velmai from whom she is estranged. It is new, however, to learn of her other two children Bruce, whom she bankrolled in one failed business after the other, and Lois, who as a child was stolen by a “feral koala”. Edna introduces a new vocal trait in this routine of switching from falsetto to bass to signify acid reflux in response to anything disturbing, like the state of Velmai’s apartment where she lives with her heavily pierced partner and several pitbulls. Between Act 1 and 2, six months are supposed to have elapsed. Dame Edna, having felt the need for even more “me-time” than she already has, has returned from a rejuvenating stay at an ashram in India that caters to celebrities. She regales us with new material about her enlightening experiences there and the strange new-found need she feels to divest herself of all her material goods. She starts by casting away a diamond bracelet into the audience although her psychic abilities reveal to her that it will doom the owner to a miserable life from then on. Further, with her newly acquired title of “Holiness” she decides to unite a man and a woman from the audience who will make an ideal couple. This routine, a variation of her onstage counselling segment from previous shows, is even funnier now than before. She doesn’t bother to ask either of the two whether they are already married until she has performed the sacred ceremony. On opening night, Edna chose very well. The woman had been married for 47 years, but her husband hadn’t come to the show. The man, well-spoken and polite, was also married and pointed to his husband sitting in the front row. Though Edna did her usual facial contortions signifying dismay, she significantly did not make a joke about the situation. At that moment I felt very proud of the young man for his forthrightness, of Canada for passing marriage equality and of Dame Edna for letting this pass, even though she couldn’t resist saying that this woman would be sure to “turn him around”. A final experience at the ashram was to find a partner in the form of a young male masseur from Bali. She now planned to retire from public life and live with him on the island with his family. This revelation was followed by her and her four-member ensemble bombarding the audience with gladioli, her signature flower, and a mass singing of her anthem “Wave That Glad”. At this point, still standing from the standing ovation she expected and demanded, another valedictory film rolls on the onstage screen showing a montage of all the famous people who have had an audience with Edna over the years. Some audience members assumed this was the end of the show. But DO NOT LEAVE. If you wait, once the film ends you are in for a major surprise, one that has never happened before at a Dame Edna show. I won’t reveal it, but it is quite possibly the most remarkable part of the entire show and definitely the most moving. Dame Edna is a brilliant melding of paradoxes. To the inherent paradox of drag as satire and homage, Humphries has added the satire of celebrity and its love/hate relationship with its audience, the satire of political conservatism with its outward show of compassion barely masking its disdain for the poor and disadvantaged and the satire of moral openness with its live-and let-live philosophy barely masking a sexual obsession and a prurient interest in other people’s lives. After one double entendre after another, Edna chides our laughter with “You’re twisting my words!” as if we were the guilty party. Dame Edna is a larger-than-life character who we wish would carry on indefinitely. But after six decades, it’s time to let her say goodbye and for us to have one more evening of nonstop laughter. Photos: (from top) Dame Edna and ensemble; Dame Edna and ensemble. ©2014 Dainty Group International.